L: Richard Lazer, Mayor Kenney’s deputy mayor of labor. R: John Dougherty, leader of Philadelphia’s building trades. Richard Lazer, a longtime aide to Mayor Kenney with ties to the city's powerful Electricians union, has decided to run for a U.S. House seat and expects to make a formal announcement in the next week or so, according to two sources close to him. On Friday, Lazer cleared the way by announcing he is stepping down from his position as Kenney's deputy mayor of labor. Under the city's "resign-to-run" law, municipal employees cannot campaign for elected office. Lazer, who joined the administration in 2016, has said for weeks that he was strongly considering jumping into the race for Pennsylvania's First Congressional District. He declined to confirm Friday that he is running, though he certainly sounded like a candidate in a brief interview. "I've lived my entire life in the First District. I've always been interested in public service," he said. "The biggest issues I would handle are jobs, education, and criminal justice reform." 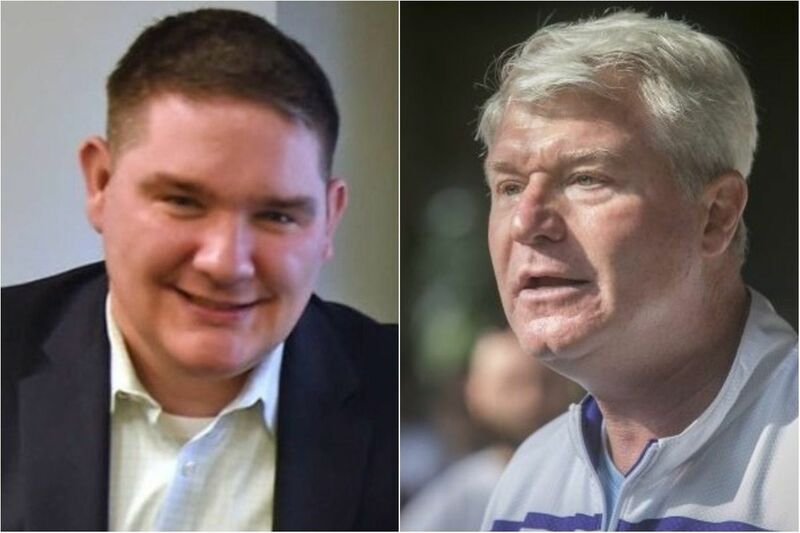 John "Johnny Doc" Dougherty, leader of the city's building trades as well as International Brotherhood of Electrical Workers Local 98, has encouraged Lazer to throw his hat in the ring. Frank Keel, a spokesman for Dougherty, said others in the labor movement have done so as well. Lazer, a Democrat, grew up in a pro-union family: His dad was a sheet-metal worker, and close relatives were in unions. In 2015, Lazer was a consultant for the Electricians, according to the financial disclosure statement he filed with the city. Union records show that his wife was also employed by Local 98 in 2014 and 2015. As deputy mayor, Kenney said in a statement, Lazer helped end the 2016 SEPTA strike and negotiate the current contract between the administration and AFSCME District Council 33. "Working families across Philadelphia are better off because of his service," he said. Lazer's resignation comes at an interesting moment in state politics: After ruling that Pennsylvania's congressional districts are unconstitutionally gerrymandered, the Pennsylvania Supreme Court is weighing several maps proposed by Democrats and Republicans. The court was expected to pick a map or draw its own by Monday. Democrat Kevin Dougherty, John Dougherty's brother, sits on the Supreme Court. Earlier this year, rumors swirled that the building trades might be pushing Lazer to run because they saw incumbent Rep. Bob Brady as vulnerable. Others speculated that Brady wanted Lazer to replace him. That was before Brady announced in January that he is not running for reelection. Now, it looks like Brady, who is also the chairman of Philadelphia's Democratic Party, is pleased with Lazer. A few weeks ago, Brady said it would be up to the Democratic City Committee to decide whether to endorse a candidate in the primary to fill his seat. But Brady said he didn't think that any of the current candidates would win the party's support. He suggested that Lazer, on the other hand, might be a good match. At the time, the Democratic candidates in the First District included Nina Ahmad, Kenney's former deputy mayor for public engagement; Michele Lawrence, a past regional president of Wells Fargo; Lindy Li, a previous wealth manager for Morgan Stanley; and Willie Singletary, an ex-Traffic Court judge who went to prison for lying to the government. Kevin Johnson, a pastor, has since jumped into the race. In 2004, Lazer began interning for Kenney, who was a city councilman at the time. Kenney then hired Lazer as a constituent services director in 2007. Lazer first met Kenney when they were part of the Jokers Fancy Brigade.